St. Patrick’s Day may be the impetus for focusing on the two artisan Irish Cheeses we are featuring here, but we are happy for any reason to showcase stellar cheesemaking. Ireland is renowned for its lush green fields and clean air. This makes it the perfect environment to produce the top quality milk needed to make great cheese. The cheeses pictured here, Darú and Cahill’s Porter, come from well-tended farms that combine creativity and innovation with respect for traditional craft and simplicity. 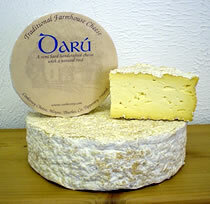 Darú is a beautifully balanced handcrafted farmstead cheese with a natural rind and long finish. It is a semi hard cheese made with pasteurized cow’s milk from the herd of the Maher family in the heart of Tipperary where the pastures are fresh and green as the Emerald Isle. 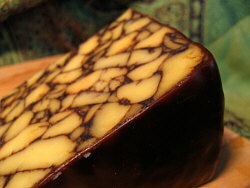 Vegetarian rennet is used in the production of this cheese and therefore it is suitable for vegetarians. Cahill’s Porter is Irish Cheddar flavored with Cahill’s own farm-made Irish Porter (a dark beer). The cheese is made from pasteurized cow’s milk. All of their cheeses are handcrafted and individually blended and have no artificial ingredients. Cahill Farms, too, uses vegetable rennet in their cheese production. These cheeses pair well with beer or stout and are equally friendly with a red wine such as our Marimar Pinot Noir. You may request either of these cheeses in one of our Wine Gift Baskets or Gourmet Gift Baskets. Put your request in the Other Info box on the order form and we’ll replace the regular cheese with the one you specify. There will be a $3.50 charge added to your order for either of these premium cheeses. The additional amount will not show on your online order but will be included on your invoice. These cheeses are, of course, available for purchase in our store. You can also call Fancifull at 800.350.4437 to order these and other products for yourself or to have us create a custom gift basket for you.